Apple today held it’s latest special event, and if you ever thought Apple couldn’t put on a good show without new hardware, then this would be the show in which it proved you wrong. It pulled out all the stops introducing its new apps, including upgrades to its existing News and TV services, along with a new credit card and a game subscription service. Here’s a quick rundown of everything you need to know about Apple‘s new wave of software. The first major development revealed at the show was an upgrade to the News app. While the basic News will remain the same, News+ offers users the ability to read past issues of select publishers, including over 300 magazines. News+ also offers a section of personally curated articles to the reader, though Apple stressed it wouldn’t know what readers read, nor would it allow advertisers to track user reads. Now we know what Apple did with Texture, the magazine subscription service it bought last year. The list of magazines in News+ includes The Atlantic, Esquire, Vogue, National Geographic, and others. 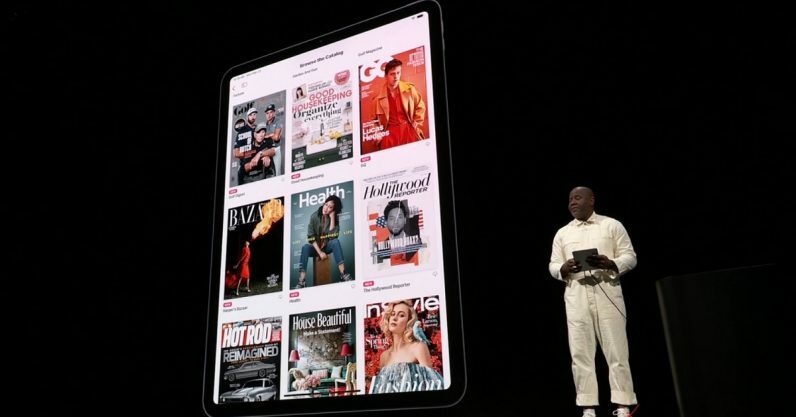 In addition to the magazines, Apple is also adding a few newspapers to its News rotation, including the Wall Street Journal, Los Angeles Times, and The Star. News+ was the only service at the show for which we received a price point: its monthly subscription will cost $9.99, and Apple was quick to tout the fact that individual subscriptions to the same number of magazines would cost thousands of dollars a year. Up to six family members will be able to share a single subscription. News+ launches next week in the US and Canada, and in Australia and the UK in fall. Apple led into the financial part of the show by showcasing upgrades to Apple Pay, including that it’ll be incorporated into public transit in New York, Chicago, and Portland. But this was just an opening salvo for the more interesting news: Apple is getting its own credit card, the aptly named Apple Card. The Card is designed to work entirely within the Apple Wallet app, though interested users can still obtain a physical version, made from titanium. With it, Apple aims to change some of the worst parts about being a cardholder, through clearer payment tracking, an easy-to-understand rewards program, and no interest fees. Check our article to learn more about Apple Card, and how it’s going to attempt to revolutionize credit cards. Apple finally revealed the game subscription service its apparently been working on for a while, titled Arcade. The service will allow users to access over 100 exclusive games, including a new Sonic game and games made by several industry stalwarts. The company is also apparently investing in the development of new games. Arcade bears a resemblance to Google’s promised Stadia, in that it’ll be consistent across all Apple devices and gamers can pick up where they left off from any of those devices. But Apple was quick to stress its games can be played offline and the company won’t collect any data you don’t agree to. The one thing we don’t yet know about Arcade is how much it’ll cost when it launches in the fall. Read more about it in our article. Apple introduced a few upgrades to its TV service first, including that it’s coming to non-Apple devices such as Roku and Fire TV. It’s also partnering with several broadcaster to bring their channels to Apple TV, including Hulu and Amazon Prime. And then came the big news, the stuff Apple as a whole had been building up to this whole show: TV+, its very own Netflix competitor, ad-free and replete with new, original shows. It proceeded to barrage viewers with rapid fire promos of the new programming it’s making specifically for TV+. It brought to the stage such familiar names as Steven Spielberg, Oprah, and Big Bird. TV+ will be available in over 100 countries when it launches in the fall, though the company, as with most of the things Apple revealed today, it didn’t reveal the price. You can read more about it in our article.